held May 6th and featured Mason County, the Port of Shelton and the City of Shelton. Friday’s luncheon featured Mason County Public Hospital District No. 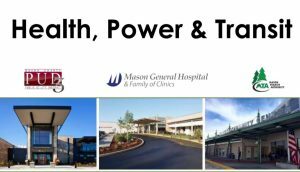 1 (the governing body of Mason General Hospital and Family of Clinics), Mason County PUD 3, and Mason Transit Authority.